To understand this article you first have to be familiar with three songs, for which lyrics are posted below. Carroll County's pointed out as kinda square. The biggest thing that happens is the county fair. The wreck was on the highway just inside the line. It seemed that Mary Ellen Jones would surely die. And he wore a golden wedding ring upon his hand. Said he was sick and could she drive him into town. 'Cause she was well respected in the county, too. The bloody seats, the broken glass, the tangled mess. A little matchbox circled by a rubber band. And inside the ring from Walter Browning's hand. I lost him in the Carroll County accident. (c) Northridge Music Company / Universal MCA Publishing. From "Ode To Billy Joe," Bobby Gentry, (c) 1967, Capitol. It was the third of June, another sleepy, dusty Delta day. I was out chopping cotton and my brother was baling hay. And at dinnertime we stopped and walked back to the house to eat. And Mama hollered out the back door "y'all remember to wipe your feet,"
And then she said "I got some news this morning from Choctaw Ridge,"
"Today, Billy Joe MacAllister jumped off the Tallahatchie Bridge." "Well, Billy Joe never had a lick of sense; pass the biscuits, please." "There's five more acres in the lower forty I've got to plow." And Mama said it was a shame about Billy Joe, anyhow. Seems like nothing ever comes to no good up on Choctaw Ridge. And now Billy Joe MacAllister's jumped off the Tallahatchie Bridge. Had put a frog down my back at the Carroll County picture show. And wasn't I talking to him after church last Sunday night? "I'll have another piece of apple pie; you know it don't seem right. "And now you tell me Billie Joe's jumped off the Tallahatchie Bridge." And Mama said to me: "Child, what's happened to your appetite? "I've been cooking all morning and you haven't touched a single bite. "That nice young preacher, Brother Taylor, dropped by today. "Said he'd be pleased to have dinner on Sunday, oh, by the way. "He said he saw a girl that looked a lot like you up on Choctaw Ridge. "And she and Billy Joe was throwing something off the Tallahatchie Bridge." And brother married Becky Thompson, they bought a store in Tupelo. There was a virus going 'round, Papa caught it and he died last Spring. And now Mama doesn't seem to wanna do much of anything. And me, I spend a lot of time picking flowers up on Choctaw Ridge. From " The Night the Lights Went Out in Georgia," Vicki Lawrence, (c) 1973, Bell Records. At Web's and have him a drink 'fore he went home to her. He said "How. What's doin'?" Wo said: "Sit down, I got some bad news and it's gonna hurt." "But your young bride ain't home tonight. "Since you been gone, she's been seeing that Amos boy, Seth." Now he got mad, and he saw red. "'Cos to tell you the truth, I been with her myself." That's the night that they hung an innocent man. Don't trust your soul to no backwoods, Southern lawyer. Walkin' on home, 'cos he didn't live far. You see, Andy didn't have many friends, and he just lost him one. The only thing Daddy had left him, and that was a gun. Slippin' through the back woods quiet as a mouse. Came upon some tracks too small for Andy to make. In a puddle of blood, and he started to shake. So he fired a shot just to flag them down. A big-bellied sheriff grabbed his gun and said "Why'd you do it?" And said: "Supper's waitin' at home, and I gotta get to it." To Andy's house and back that night were mine. That's one body that'll never be found. You see, little sister don't miss when she aims her gun. I don't consider myself especially stupid. Sure, it sometimes takes me a while to catch on to certain kinds of things (like calculus, which troubled me in college), but when it comes to the arts, I think I'm pretty sharp. And in Ridley Scott's film Blade Runner, I quickly understood and appreciated all the little cinematic hints that Deckard, himself, may be a replicant - one of the biologically engineered beings he hunts down and kills. The odd thing about me is that when it comes to the Country-Western ballad I'm totally lost. And that's where Carroll County Accident, Ode to Billy Joe and The Night the Lights Went Out in Georgia come in. The first song of this trilogy I had heard was the Ode to Billy Joe, which was a hit for Bobby Gentry in 1967, when I was eleven. The lyrics completely mystified me. What was thrown off the bridge? And why? I didn't find out until after I had married my dear wife Cari, in 1980. A sharp person herself, a constant reader and a former disk jockey at a radio station, Cari understood popular music. Being female, she also understands human interrelations far better than I do. Cari's sister had seen a movie adaptation of the song that explained the mystery: Billy Joe MacAllister was a self-repressed homosexual, and leapt to his death out of shame and frustration. Or something like that. I don't know if that's what Bobby Gentry intended - the lyrics are pretty abstruse. I assume that, because she's the songwriter and presumably owns the rights to the song, that she was consulted by the filmmakers and approved of the plot. Vicki Lawrence had a hit with The Night the Lights Went Out in Georgia in 1973, not long after American Pie arrived to befuddle me. At the time I was seventeen, and trying to wrap my brain about who did what to whom and why the lights went out, puzzled me. I figured the reason why the lights went out (which I assumed was the most important part of the song), was because somebody was electrocuted for murder in a place in the American South served by a rickety power grid. It was only until Cari, exasperated, pointed out the key lyric "Little sister don't miss when she aims her gun" that the figurative lights came on for me. Duh. 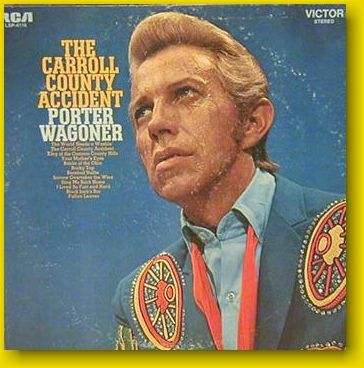 Carroll County Accident I have never heard; I came across it when I did an article about the amazing LP cover art of Porter Wagoner not long ago. What caused my interest was visual: Who is this man with the sculpted hair and the outlandish wagon wheels on his jacket, why is the camera angle so odd, and why is sweat streaming down his face? Is he watching the Carroll County Accident? Or does he know it's about to happen? Or, worst of all, did he cause it? Intrigued, I did some searching on the Internet and came across yet another puzzling, subtle set of lyrics - which I printed out and took home for Cari's analysis and explanation. Cari: "Wes, we've had this conversation before; she's the friend of my cousin, who had the kid with the eye problem. Remember? She was in a car wreck?" Me: "On the Tallahatchie Bridge?" Cari, you see, has a stunning capacity for remembering the details associated with other people's lives. As for me, I'm an engineer. When it comes to most people-details, it goes in one ear and out the other. Perhaps that's why I have problems with song lyrics in the first place. My wife might disagree, but this whole matter has had the odd effect of enriching our married life somewhat. After all, when people stop communicating, they grow apart. And even an argument is still conversation. (Not the preferred means of communication, I know.) I was amazed to discover that, when Dad died, after 25+ years of married life where they constantly bickered and argued, Mom had all the usual signs of grief and heartbreak. She had actually loved him. So every time the subject of song lyrics in songs comes up between Cari and me, I smile. As we are rapidly becoming empty-nesters and the topics of conversation are less centered around the logistics of raising kids, this can be expected to happen more often. I suppose it would be a good thing for our marriage if I became less of a tease. NOTE: Cari didn't pick up on the fact that, according to Bobby Gentry, the Tallahatchie Bridge is in Carroll County. (Where Porter Wagoner's accident took place?) Ah... but which Carroll County? Doing a quick search on the Internet, I see Carroll Counties in Iowa, Maryland, Kentucky, Arkansas, Ohio, Tennessee, Mississippi and Georgia (where the lights went out). Possibly other states, as well. However, since the Tallahatchie Bridge is in Mississippi, Bobby Gentry must be talking about that state - her state of birth, as it turns out. By the way, there is no Candletop, Georgia, which is mentioned in Vicki Lawrence's song. If there were, I feel certain it would be in Carroll County, Georgia. Trivia from Avocado Memories reader Ken Denney! From wordiq.com: "The country song Carroll County Accident, a hit for and now one of the signature songs of Porter Wagoner, was written by noted country songwriter Bob Ferguson when he passed through Carroll County when driving from Nashville to Memphis on U.S. Highway 70." So Porter's Carroll County is in the Volunteer State. Additional info from Internet correspondant William Scott Lincoln: "I happened to brush past your site when I was looking for information about the song "Ode to Billy Joe." Just thought I'd point out that I found out that the event probably didn't take place in Carroll County, Mississippi. The Tallahatchie River doesn't run through there. It runs down into the delta region of Mississippi south of Sardis, MS. 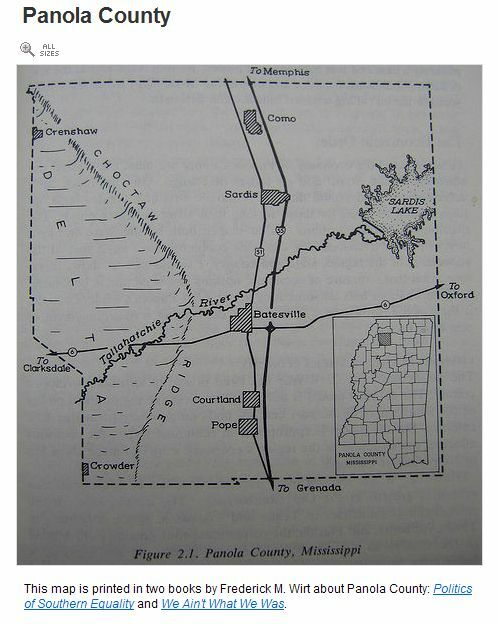 I also found a site that has a scan of an old map of that county, where the separation between the delta lowlands and the highlands to the east was once known as Choctaw Ridge. So where the river comes down from the highlands would be where the song is describing." Postscript by Wes, 7/26/06: I just listened to Herman's Hermit's "Henry the Eighth." I just realized that the reason why he's the eighth is because the widow's been married seven times before (I always misheard it as "several.") So he's the eighth husband - therefore, Henry the Eighth. Since 1965 I thought the song was about the historical character Henry VIII - I obviously didn't bother listening to the lyrics.